Embrace history and timeless design at the Sheraton Gunter Hotel San Antonio. 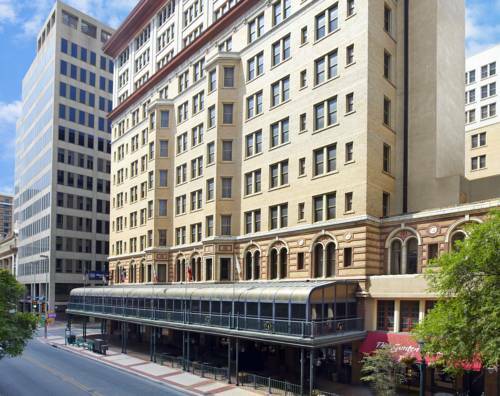 Located in the heart of downtown San Antonio, our hotel places you in the middle of all that is San Antonio. Take in a show at the Majestic Theater or stroll down the world-famous Riverwalk both are just across the street.Built in 1909 and updated by a multimillion-dollar renovation, our hotel combines the ageless grace of the 1900s with todays upscale amenities. From an old-fashioned barber shop, complete with barber chairs from the 1920s, to complimentary High Speed Internet Access at computer workstations in the lobby, we will keep you connected to whats important, even when youre miles away from home.Our refreshing outdoor pool is a great place to cool off and wind down, or you can break a sweat at Sheraton Fitness. Share a delicious meal or grab a fresh-baked pastry at the new Market on Houston.Enjoy a great location and comfortable stay at the transformed Sheraton Gunter Hotel San Antonio. We hope you leave time to explore the local sights. Market on Houston is an urban marketplace, caf , and wine bar. Using local and seasonal ingredients, our downtown San Antonio restaurant offers farm-to-table contemporary American cuisine with a twist. Join us for our foodie happy hour on weekdays. Bar 414 pays homage to the hotel s rich history and to Robert Johnson with prohibition-era cocktails stirred with house-made ingredients and bootleg spirits. Enjoy live music, discreet libations, and delta blues within a speakeasy ambience.